The dogs days of summer, that seemingly endless stretch of high heat and high humidity. July and August are summer's answer to winter's February and March, an ultimately monotonous stretch of sunny and steamy instead of cold and dreary. This time of year is about going slow and waiting, waiting for the afternoon thunderstorm to break the heat, waiting for the whine of a mosquito, waiting for tomatoes to ripen. The air itself is liquid, languorous. Summertime leaves the skin "glistening" and the mind slowing. Estivation. Here's an extra recipe, a perfect use for the leftover apricot nectar: Take 1 Ice-filled glass, fill with 2 parts sparkling water, 1 part apricot nectar, 1 splash of vodka, a wedge of fresh lime, sip. Ahhhhh! So, before I slip into my best Blanche DuBois, here's a recipe for yet another glaze, (given your previous responses, you crablings love sauces and glazes). The work in this recipe is pretty minimal and thankfully is done in an air-conditioned kitchen. 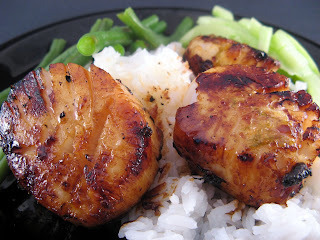 Today's presentation is on grilled sea scallops, though it would work equally well on boneless, skinless chicken breasts. Combine the glaze ingredients in a small saucepan over medium heat. Warm, stirring to incorporate all the ingredients. When heated through, remove and allow to cool to room temperature. Clean the scallops removing the tough tendon from the meat. Pat dry. Thirty (30) minutes prior to grilling, toss the scallops with the room temperature glaze. Pre-heat your grill over medium high heat. For this recipe you want to protect the scallops from direct contact with the grill, so either use a fish grilling pan or fold a large sheet of aluminum foil in half, spray with PAM and grill the scallops on top of the foil. Grill the scallops for approximately 90 seconds per side (If the scallops are dry-packed and fresh I like them at a medium-well doneness, if you insist on completely cooked through, go for 2 minutes per side). Remove. Serve with a light salad or some steamed rice. Listen to a baseball game on the radio. Let summer wash over you. Serve this with a nicely chilled New Zealand (Marlborough) Sauvignon Blanc. "I have always depended on the kindness of strangers". 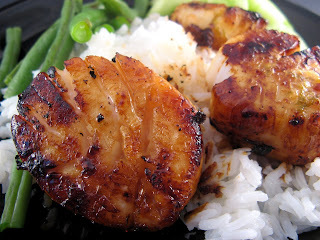 I love the little brown crusty bits that the scallops take on! So delicious! Those aren't scallops. Those are little golden nuggets of happiness! Fantastic! These are the hardest months to figure out "light" meals to cook. I will try this one.